Copper containing High Strength Low Alloy (HSLA) steels, typically HSLA-80 and HSLA-100, are of particular interest for large submarine and offshore structures, pipelines, hulls of ships, etc. and these applications often demand a combination of strength, toughness and weldability. In order to attain the desired properties, several alloying elements, such as Mn, Cu, Ni, Cr, Mo, Nb etc., are added to exploit the benefits from the alloy chemistry. However, for obtaining a very high strength level (i.e. 550MPa in HSLA- 80 and 690MPa in HSLA-100) copper addition plays a crucial role, as it contributes to strength through the precipitation hardening process. The amount of copper precipitating as well as its size and morphology govern the properties of the copper bearing steel. During the last three decades, several high yield steels (HY-80, HY-100 and HY-130) were developed for submarine-hull plate and hydrofoil applications. These are generally quenched and tempered (Q & T) steels and possess high strength (80–130 ksi YS) due to their martensitic structure. However, owing to the high carbon level, the weldability of these steels was not sufficient. Over the past three decades, considerable research has been directed to increase the strength level of the steels in combination with good toughness and weldability through newer alloy design and processing routes. Reduction in carbon level is essential for improved toughness and better weldability. 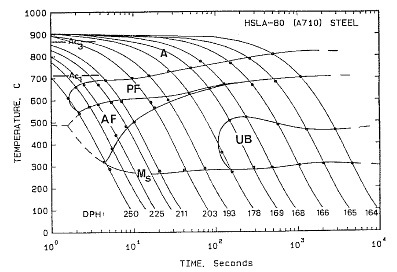 In the early 1980s, the US navy developed low carbon Cu bearing HSLA steels (HSLA-100 and -80) as a replacement to HY-100 and -80 steels. The low carbon content in these steels is compensated by adding an increased amount of alloying elements like Ni, Mn, Cr and Mo to increase the hardenability of austenite. 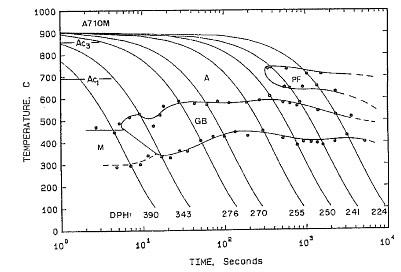 Microalloying elements i.e. Ti, Nb or V, which are incidentally a strong carbide former and also act as a grain refiner while in solution in austenite, are also added in these steels. On subsequent cooling, these microalloying elements precipitate as carbides and/or carbonitrides. These precipitates are fine enough to offer a hindrance to mobile dislocations leading to a significant increase in strength. An additional strengthening is obtained from fine ε-Cu particles upon ageing. Thermo-mechanical controlled processing (TMCP) is another technique, which enhance the strength level of HSLA steels by prior austenite grain refinement, precipitation hardening together with dislocation sub structure strengthening. Currently, there is a strong interest to develop the high strength steels in hot-rolled condition as a substitute of quenched and tempered steels to reduce the production cost. Moreover, some metallurgical defects like quench cracking, distortion or residual stress associated with the latter is also minimized. The developments in the area of high performance structural steel were demonstrated in several research papers of a conference held in 1995 in Ohio, USA. A few attempts were made to replace HY-130 steel with newer alloy design and lower carbon content for better weldability and improved toughness. However, research in this area is still in progress to meet the target requirements. 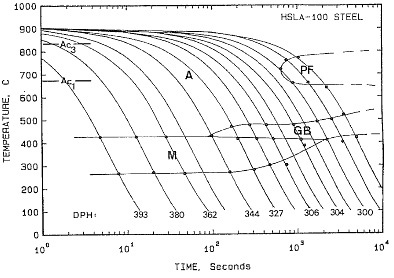 To better understand the response of characteristics of austenite decomposition, CCT diagrams were developed for three of the alloys: HSLA-80, A710 Modified and HSLA-100 with 0.06%C. These diagrams are useful for understanding the transformation response of these alloys to water quenching of carious plate thicknesses from austenitizing temperatures. The CCT work was performed on a Gleeble 1500 machine. The specimens used in the study were 6.35 mm round and 101.6 mm in length. This entry was posted in Copper, High Strength Steels. Bookmark the permalink.